If you are a meal kit lover on a gluten-free diet, you probably already know that Blue Apron does not have special meals and meal plans dedicated to those who need to avoid gluten. However, this does not mean that you have to miss out on all the deliciousness. Just like when you are out shopping for groceries, you just need to take the time to read the labels. Blue Apron gluten-free recipes are not clearly labeled, so they are a bit harder to spot. 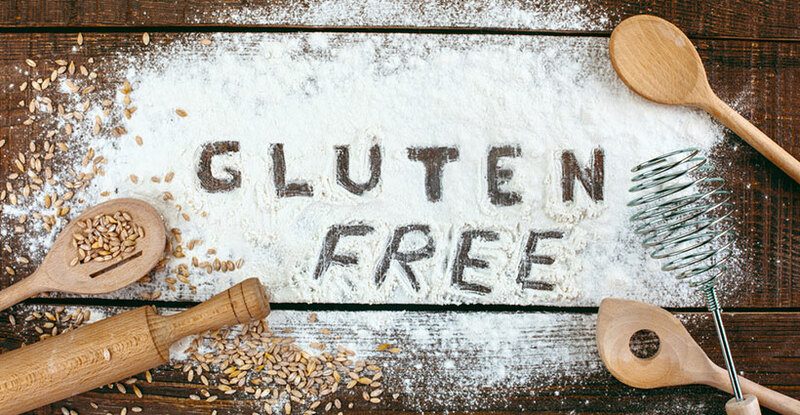 Usually, there are at least 1 or 2 gluten-free options on the menu, but in order to identify them, you need to take a look at each individual recipe available. Luckily, Blue Apron recipes come with complete nutritional information, including warnings about allergens. Therefore, all you need to do is take a look at the table provided and see if there is anything to worry about. Sure, it would be much easier if the service just tagged its recipes as gluten-free and spared you the hassle, but if you are familiar with the masterpieces Blue Apron chefs come up with on a weekly basis, you know that the delicious meals on the company’s menu are definitely worth the trouble. Crafted by a team of experienced professional chefs. If all the reasons above are not enough, we will just highlight that these are original recipes that you cannot find elsewhere. Each recipe is exclusively crafted for Blue Apron patrons, so if you are itching to try something new and bring more variety to your diet, Blue Apron gluten-free recipes are a perfect choice. Before we proceed to some of our favorite Blue Apron gluten-free recipes, we have to say that all Blue Apron ingredients are produced in the same facility. Thus, even though the staff takes great care that everything is clean and there is no cross-contamination, some tiny traces of gluten may end up on the gluten-free ingredients. Although the chances of this happening are rather low, we still do not recommend Blue Apron meals to individuals with a severe gluten-free allergy. Finally, it is time to move on to the part you have been waiting for. Without further ado, we present you some of the finest Blue Apron gluten-free recipes. 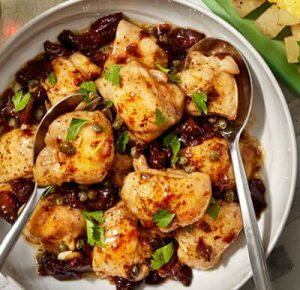 We are big fans of Italian-American cuisine and this quicker, even more beautiful gluten-free version of chicken Marbella has impressed us beyond words. The dish features tender chicken thighs briefly roasted in the oven and then finished in a pan, soaking up all the gorgeous aromas beaming from the sweet and tangy sauce. As for the sauce, it boasts a variety of exciting Mediterranean flavors, including that of capers, prunes, oregano, and garlic. The dish is made complete with a wonderful medley of roasted potatoes and summer squash served as a side. Easy and finger-licking good! For the days when you are craving something light, tasty, and unbelievably healthy, this seared salmon is a perfect choice. We just love how the refreshing, fragrant sauce made of lemon and ginger enriches the already delicious, juicy salmon with even more vibrant flavors. The nutrient-rich, flamboyant side includes peas and carrots cooked with lemon, honey, and butter and mixed with delicate long-grain rice and gorgeous, crunchy pea tips. If you want to make your meal even more special, serve this lovely dish with a bottle of your favorite white wine. This one is a real delight for all the meat lovers out there who need to steer clear of gluten. It only takes around half an hour to make and the result is nothing short of perfection. 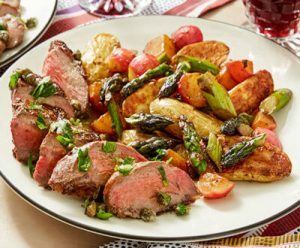 The rich, tender seared steaks are combined with a wonderfully crisp sauté of radishes and asparagus, as well as melt-in-your-mouth roasted fingerling potatoes. The flavor of the steaks is elevated with the aromatic salsa verde topping featuring garlic paste, capers, lemon, and olive oil. Beautiful to look at and a pleasure to taste. We hope that you have enjoyed our selection of Blue Apron gluten-free recipes and that we have inspired you to try them out soon. They are creative, healthy, quick, and simple, so even if you are not a culinary master, you can make a great gluten-free meal you can be proud of with very little effort. Although there are not many gluten-free options available every week, each recipe is unique – and dare we say, unforgettable. If you like what you’ve seen, keep in mind – there are plenty more delicious dishes like these waiting for you in the Blue Apron cookbook, so get browsing and discover more Blue Apron-style gluten-free delights.